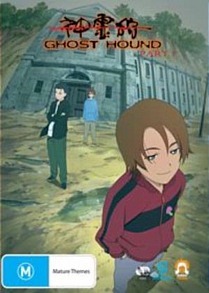 Ghost Hound’s production credits read like a who’s-who of the animation world, and include director Ryutaro Nakamura (Kino’s Journey), art director Hiromasa Ogura (Ghost in the Shell), animation director Mariko Oka (Hell Girl) and screenwriter Masamune Shirow (Appleseed). With such an impressive pedigree then, it’s no surprise that the series itself is first rate. All eleven episodes of Part 1 are included here, and revolve around a trio of high school acquaintances who, due to some past trauma, have discovered the ability to enter a parallel realm known as the Unseen World. There’s Taro, a 14-year-old narcoleptic haunted by the kidnap and murder of his sister; Makoto, who is tormented by the suicide of his father; and Masayuki, who once bullied a fellow student to the point of taking their own life. During the course of their out of body experiences the boys inadvertently open a portal into the Unseen World, and their sleepy town of Suiten is soon overrun with ghosts and other paranormal entities. The daughter of the local priest is eventually possessed by a malevolent spirit, and it is up to the three boys to come to terms with their own abilities, as well as the horrors of the past, in order to save her. Ghost Hound is an endlessly inventive and highly original series. It’s hardly the most light-hearted of fare and some of its themes are truly harrowing, though thankfully these are tempered by some excellent vocal performances courtesy of the Japanese cast and Nakamura’s flawless direction. The cinematography is also stunning throughout and the spirit world is effectively, and sometimes chillingly, rendered, thanks in part to a sublimely evocative score. The colour palette veers from lush and resonant to darkly macabre depending on the subject matter at hand, the pacing is tight and the storyline is gripping from the outset. There are no bonus features worth mentioning, just some trailers and an image gallery, but with eleven episodes spread out over three discs, as well as some extremely handsome packaging, you aren’t exactly left feeling short changed. Ghost Hound is a thought-provoking and highly successful series, and one that’s highly recommended for those who like their anime both meaningful and mysterious.